Hatters defender Alan Sheehan felt his side badly let down manager Nathan Jones during their 1-0 defeat to Stevenage at the weekend. 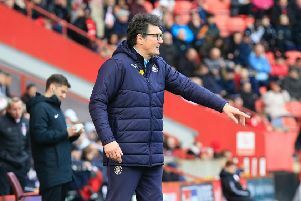 Prior to the game, boss Jones has spoken of the match kicking off a crucial period of three home fixtures in a row that could propel his side into serious play-off contention. However, that looks miles off now as Luton never got going against their local rivals, and were eventually undone by Michael Tonge’s late penalty. Sheehan said: “He’s (Jones) said that it wasn’t good enough and personally I feel like we’ve let him down, let the fans down, it was as a good crowd in for the local derby, but we’ve let ourselves down more than anything. “The manager works hard and that’s why we feel like we’ve let him down and I’m ashamed about that. “I thought we’d turned a corner, but we’ve let him down, we know it and we’re a bit embarrassed about it, but we have to try and put it right now. “We all know we could have been a lot better from one to 11 and that’s the way it goes. “Sometimes you just need a goal to go in, or a ricochet, but we just didn’t really have that. On just what went wrong on the day against a side who have been struggling at the wrong end of the table for the majority of the season, Sheehan continued: “They’re a team fighting for their lives and they looked like that. “If they played like that every week they wouldn’t be where they are, so maybe they should do that every week. “Maybe they raised their game for us, but they were ready and it just looked like they kind of wanted it more, but it’s not good enough from us. “They were picking up a lot of second balls and we were giving the ball away in sloppy places as they had done their homework on us.